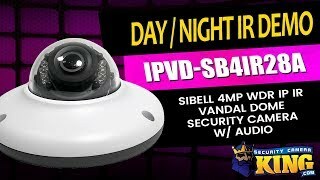 Our newest security camera from Sibell is this indoor and outdoor, low-profile, 4MP vandal dome that is just over 2 ¼” in height. That makes for a perfect size to fit in otherwise difficult spaces and it’s less conspicuous. With a 2.8mm fixed lens, you’ll get a wide view of larger spaces where you don’t necessarily need as much detail or place it closer to your region of interest (ROI) for more detailed images. These would be perfect for placement in a number of situations like above a cash register or doorway in a retail location. If you have areas where there is little or no light, you’ll be happy to know that this camera has IR (infrared) that can come in handy and save you money if you were thinking you would have to add lighting, Thanks to the built-in LEDs, you'll be able to see up to 30 feet in the dark! Add the use of true WDR (Wide Dynamic Range) where the camera can catch a greater range of brightness and produce clearer more vivid video, and you’ll be able to see detail that you’ve only imagined. Thanks to a variety of additional settings that are adjustable through client software or a web browser, you can customize this camera to work just right for your particular environment. HD resolution and so many great features packed into this little camera make it an amazing value. When you need to be able to hear what’s going on, you’ll be thankful that this camera has a built-in microphone that makes it an indispensable tool where you can see AND hear what’s going on. There’s even an onboard TF card slot so you can record footage up to a 128GB card and easily share specific footage with whomever you need. You can easily supply power to your camera with a choice of PoE (Power over Ethernet) or a standard 12V DC power supply. When it’s important to keep your cameras up and running, you’ll be happy to know that all of our Sibell cameras include a 2 year warranty, FREE US based tech support and FREE remote monitoring software.